The Thousand-Year Door Description Fruit from a tropical island. To be honest, it ain't tasty. A Coconut is a tropical fruit found in many games in the Mario franchise. 1.2.1 "Donkey Kong in: Banana Day 24"
Coconuts appear in the Donkey Kong franchise. In the Donkey Kong Country games, they are shot by Neckys and Mini-Neckys as a form of attack; Master Necky and Master Necky Sr. also spit them as their sole attack. In Donkey Kong 64, Donkey Kong uses his Coconut Shooter that fires coconuts. Another type of coconut is the Crystal Coconut, which carries different powers depending on the media that it appears in. For example, in the Donkey Kong Country television series, the crystal coconut has healing and fortune-telling properties, whereas in Donkey Kong 64, Crystal Coconuts are a consumable source of power for the Kongs' special abilities. "Donkey Kong in: Banana Day 24"
Coconuts also played a role in the Donkey Kong comic "Banana Day 24," published in the German magazine Club Nintendo. In this story, giant aliens connected Earth to their spaceship, pulling the planet away. As it turns out, they erroneously took Earth for a huge coconut, a fruit their species adores. They agree to return the planet back to its original position as Diddy Kong starts to give them Bananas in return. Coconuts appeared in the games Paper Mario and Paper Mario: The Thousand-Year Door. These items are found only in certain Coconut Trees. In Paper Mario, such trees can be found near the shores of Lavalava Island as well as in Yoshi's Village, though some of the trees drop other items. In Paper Mario: The Thousand-Year Door, only one Coconut Tree is found, on a small island behind the bridge scene in Keelhaul Key. To get them from the trees, Mario can simply whack them with his current Hammer. Coconuts are used in many recipes. In Paper Mario, its use is as a weapon; it can be thrown at a single enemy to deal 3 HP damage. Mario can sell them at any shop for 1 coin. In Paper Mario: The Thousand-Year Door, it can be eaten by Mario or his partner to recover 5 HP instead. They can be sold to shops for a varying price from 1 coin to 4 coins. In the same game, Mario must give one to Flavio on Keelhaul Key to obtain a Chuckola Cola, which must be given to Admiral Bobbery in order to revive him. Coconuts are also mentioned in the Paper Mario Tattle for Stone Chomps. Three Coconuts from Super Mario Sunshine. Coconuts also appeared with various other fruit in Super Mario Sunshine at Delfino Plaza. Sometimes, it must be used as bait for a Yoshi to venture out of its egg. If a Yoshi eats one, it will turn pink and refill its juice. It can also be thrown by Mario. There are also tasks in the game if the player puts enough of them in a basket (or other fruits) that the player will be rewarded with a Blue Coin or 1-Up Mushroom. 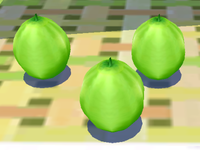 Unlike all other incarnations of the fruit in the Mario franchise, the ones in this game are still in the husk, which is green and smooth, rather than brown and fuzzy. Coconuts also appear in Super Mario Galaxy. Mario can spin into them to send them flying. This is useful for defeating enemies such as Pokeys and thorny flowers. They are also used by King Kaliente and Octopuses as projectiles. When 9999 Star Bits are collected, all coconuts become watermelons. Coconuts reappeared in Super Mario Galaxy 2 from the previous Super Mario Galaxy game. Like its predecessor, coconuts are used to defeat Octopuses, Prince Pikante, open chests, etc. The way for making all coconuts become watermelons was also the same, by collecting 9999 Star Bits. This page was last edited on February 27, 2019, at 09:18.